Above Image: Gibson (Scilly). Copyright Morrab Library Photographic Archive. Fishing fleet, luggers off Newlyn. c.1890. Mount’s Bay luggers and steam drifters were in use in the heyday of fishing. They would go all the way to the Norfolk coast, sailing from Newlyn to Yarmouth, for mackerel in the winter. Above Image: Copyright Morrab Library Photographic Archive. Selling pilchards. Once the morning’s catch was landed the ‘jowsters’, local fish hawkers, lined the quayside to capture the first sale. 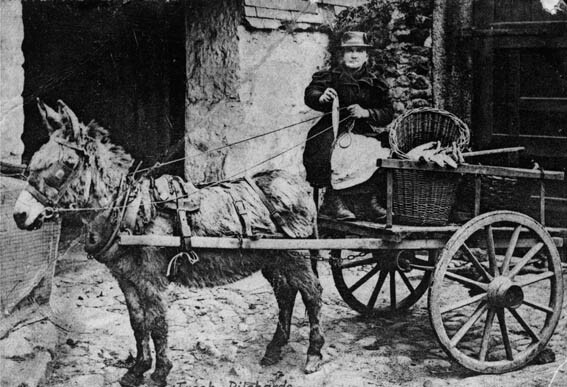 They walked the streets with the cowel, a large willow basket indigenous to west Cornwall, carried on a hand-woven tumpline across the forehead, or set off inland by pony and trap, and later by motor van, to sell to the cottagers who would salt their own supply of pilchards for winter consumption. Above Image: Penlee House Gallery and Museum, Penzance. Vaughan T Paul. 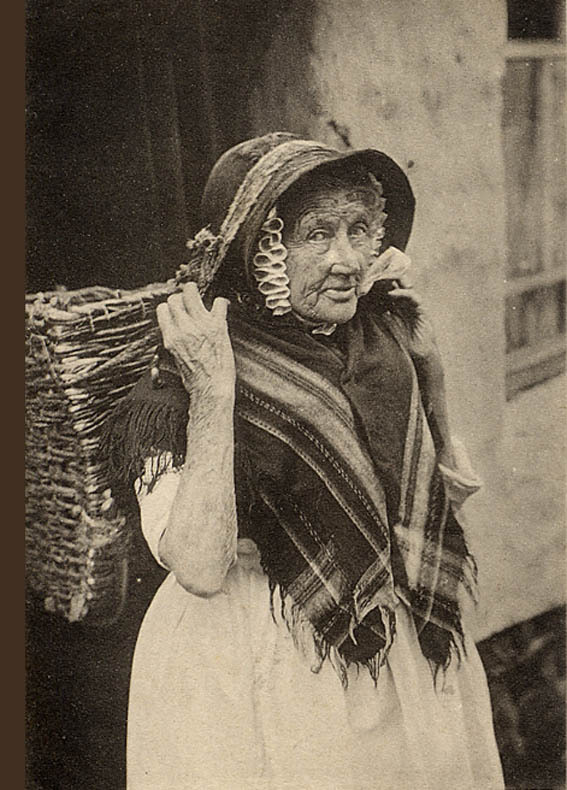 Cornish Fishwife, Blanche (Courtenay). c.1890. Fishing was a principal occupation round the southwest coastline. Long line and seine netting methods were used to catch a variety of fish. 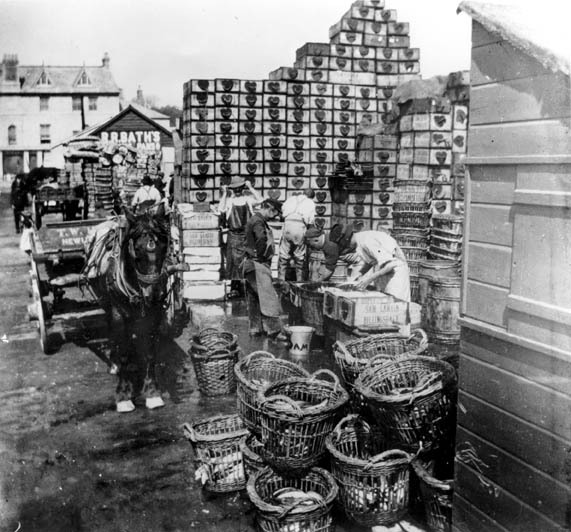 In summer large shoals of pilchards arrived in the local Cornish waters, providing the majority of the income. They were caught using seine boats that enclosed the shoals, co-ordinated by the lookouts or ‘huers’ positioned on the headlands. From 1555 Cornish pilchards were salted whole in bulk. In the fish cellars and curing stores they were immersed in tanks of brine for six weeks before being pressed into barrels and boxes and exported to the Catholic countries of Europe. 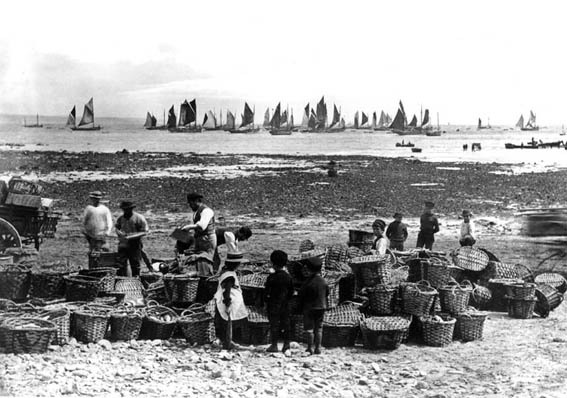 Baskets were essential to the fishing industry. They were used to hold the catch, to transport fish from boat to shore, and served as a measure for selling them. There were a variety of baskets for different purposes and all were of necessity robust in order to withstand the manhandling on the boats. 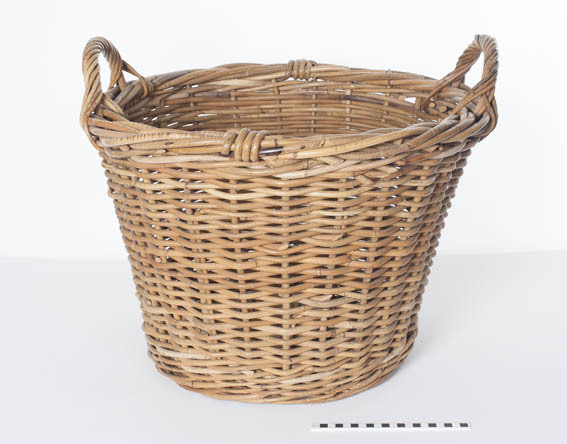 Early baskets such as the cowel (caul, cawal, caul, cowal), dating to around the 1890’s to early 1900’s, would have been woven from local brown willow. (Palembang cane) imported from Indonesia in container loads. in turn to the line coiled in the basket so that it could be fed out evenly without tangling. These baskets had one handle so that they could be hauled across the decks. 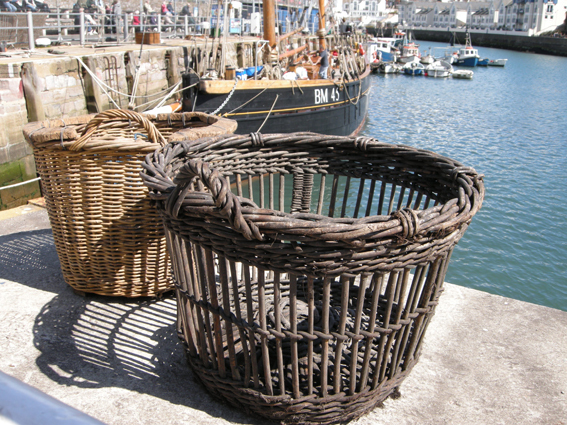 Rattan fish basket used at Brixham. The now famous Brixham sailing trawlers worked off the south Devon coast. Their catch was flatfish from the sandy bottoms. 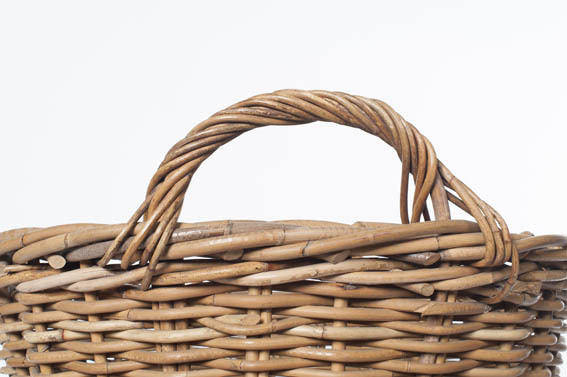 Handle detail on rattan basket.